The most technologically advanced product we have launched in many years has now arrived. The all new TRILOGY 2 POWER MARGIN POLE. To say this has improved the previous model is a total understatement. The original Trilogy XRS Margin pole has been out 4 years and each year was voted by the anglers themselves as Margin pole of the year. That shows just how good that model was. The new one, the TRILOGY 2 MARGIN POLE is outstandingly better. This achievement is born from a brand new Military grade material which has never been seen before and has outstanding qualities which have totally exceeded our expectations. As we all know, to achieve even just a slight improvement on an already top quality product is extremely difficult, but we have gone much further than that. It is made on the same mandrill as the previous model so that all sections will inter change and therefore anglers can easily upgrade. 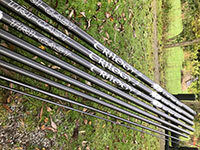 This new TRILOGY 2 MARGIN POLE, is slightly lighter, and as strong if not stronger than the previous model. The vast improvements have come with the feel of the pole when fishing. It is so much Stiffer and Responsive. Quicker on the strike with instant power to get very large fish away from the snags and margins etc. It feels, even at its longest length of 12.2mtrs, just like you are holding a very expensive top end flagship pole. Yes it is that good. You can use the pole for anything in any situation. Small silver fish because it is so responsive and the largest of fish because it has fantastic strength. Rated at up to a 25s Elastic, and we all know the reputation of strength that Tri-Cast products have. We have also maintained our very own XRS manufacturing process in its production to give an even added extra strength. The pole as standard comes at 9mtrs with a spare power top 2 kit. Plus its own holdall, Cap and Towel. There are two extensions available. The first one takes it to 10.6mtrs and the second to 12.2mtrs. Both these extensions are not parallel and so it will still all pack away into one even at 12.2mtrs. A super stiff top 2 cupping kit complete with 2 cups is also available. N.B. Extensions are not parallel so all packs away into one.